Clutter-Busting Challenge Day #15: I’m starting to have to dig pretty deep! I’m starting to have to dig pretty deep to find things to get rid of — I think that’s a good problem! I did really well this weekend. Half of the kids were at their father’s house, which makes purging so much easier. 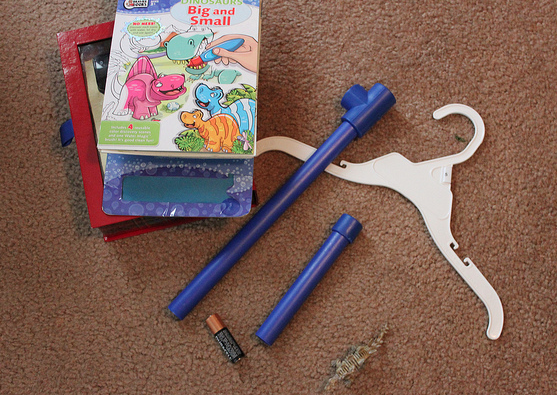 I got rid of a bunch of cheap toys, papers (tons of papers! ), junk from outside, some bad socks, and a few more outgrown kid clothing items. Tonight, I will be going through my home office and will also be turning over some of my PTO items at tonight’s meeting, which will be a big help, as I have binders, papers, checkbooks, deposit slips, bank bags, and old records. How do you get past the guilt of getting rid of something of your kids that they may still want one day? I can throw away almost anything of mine, my husbands or older son but when it comes to tossing toddler toys Im stopped cold in my tracks!! Help me rationalize this please!!! Thanks! Oh, Mamas, please don’t get rid of all your child’s treasures and memories!! I am missing things I wish I had and it still makes me sad. Save anything you know is VERY IMPORTANT to them like their favorite blankie or binkie/paci/fufu or stuffed animal. Regarding the crafts, if you can’t save them all, at least take some high-quality pictures of them and label (digitally, I don’t mean print them out) what they are (supposed to be) and how old the child was when they made them, etc. Artwork can be scanned and saved digitally. A scrapbook of memories, without the items themselves, is way better, IMHO, than not having anything at all. Make wall art for your family or living room. You can go over to Hobby Lobby and purchase a frame with a 40% off coupon. Then buy a really cool mat for it take it home and place like theamed items. This is really cool looking on a wall and a lot cheaper them some art you’ ll find. I have five kids and if we save everything, it would drive me nuts. I try to save just a few special things. I just read a book where the author said that keeping things that other people could be using is gluttony. So im trying to pass things along. I aim to only keep the absolute favorites. My mom kept my favorite blanket, a few favorite stuffed animals, and 2 dolls. It was the perfect amount to pass on. My husband’s mom kept every blanket that she used with him. And then gave them to us for our first kid. I was torn since we had other blankets that were made especially for our son, and we ended up with about 20 blankets total. We gave away some of them, but most had to be chucked because of mold, or age, or just plain falling apart. It’s sad to me how many were chucked that could have been enjoyed by a different child years ago. As far as art, we scan and save the favorites. I also aim to keep the first of anything – first painting, first crayon, etc. My friend scans and then posts her daughters art to a blog that she is turning into a book. I’ve also sent some of the art projects to grandparents to enjoy. I’m considering turning the art into a blanket for my kid when he’s bigger. I live by the idea that while I want some stuff for my kid, I also don’t want to fill their house (or mine) with clutter. Sure it’s momento clutter, but it’s still something that will need to be stored, or displayed, etc. 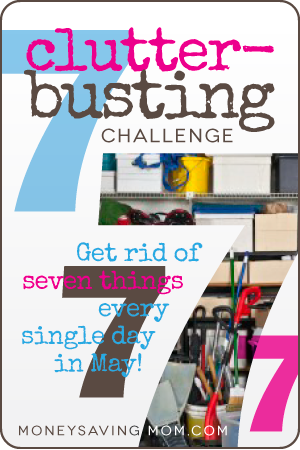 i love the clutter busting challenge! though my favorite challenge was the one you did last year where we clean out specific parts of our house/life every day. Golly… if you need help finding things, you can certainly come to my house and help me. I’ve got dozens and dozens… possibly scores of things to get rid of! I worked on my daughter’s dresser today. We just worked on one drawer as it was overflowing with clothing. So it was really time to go through and see what she doesn’t really wear and let those items go to a new home. I am trying to think of what area to dig next. Thinking DVD collection. I am loving this challenge though it is really opening up my eyes to how a lot of my clutter problem is caused by me not taking just few seconds to toss and item that is just lying around. I just donated all my DVDs, we don’t even have a player for them anymore! Hard bit good to get of! Give yourself permission to stop the challenge! Just keep encouraging the rest of us! As I am typing my kids are in the garbage can saying “mom, this is good, you can’t get rid of it!” I am being pretty brutal about getting rid of toys. Keeping the ones that are creative play like trains, cars, Legos, craft supplies but getting rid of one function toys. My plan as they out grow things is to have a bin for each that they can keep special things in for remembering. I don’t want them to have a “saving” problem like me! I took note of a post left by one of your readers regarding a book they were reading, The Joy of Less (I think it was Victoria and I’d like to thank you!) I thought it sounded like it might be interesting so, I requested it from the library. Oh my gosh! I can’t tell you how in sync I am with this book right now. It came in last weekend and once I started reading it I couldn’t put it down. I had been following this series and thought I’d done a good job going through my belongings, decluttering and eliminating most days. But the book suggested one would get better and better at eliminating “stuff” so, I decided to go back, as suggested in the book, and go through what I’d left behind the first time and see what all I could do without. I was pleasantly surprised at how much more I was willing to give up. I had been contemplating going the minimalist route for some time and I have to say, I am so glad I took the plunge. I only wish I’d done it sooner! I’ve completed the majority of my home and have a foyer closet, storage closet and one bedroom left. Not looking forward to taking on the bedroom closet I so masterfully pack-ratted an enormous amount into, but I’ve accomplished much and feel so empowered thus far I’m willing to tackle it on my next day off. Oh, I can’t encourage you enough to read this book if you haven’t already. As a married woman and a full time student, I could barely find the time to de-clutter. However, I recently graduated and I finally decided to start the challenge. I was able to find about 15 items in about 10 minutes that are going to be donated. Thanks for the inspiration. i also got rid of some sales flyers and miscellaneous papers. still planning on doing the toys this week but that is a whole day or maybe even two project…. Question: Is Jesse a natural declutterer too? If not, do you basically leave all his things alone? What if he were a hoarder? So great to meet you, too! Jesse isn’t such a minimalist as me, but we’ve struck a happy middle ground that works well for us. I think compromise and communication is key when it comes to things like this. I managed to get rid of 21 clothing items of my daughter’s! I don’t yet have the ‘dig deep’ issue! 🙂 So far, we’ve easily packed away at least 15 things a day and this was just all of our bedrooms and the basement family room! I didn’t think there was much clutter, but I realize it’s just nicely hidden from main view. That is a great problem to have. I have WAY too much to continue to go through, but this challenge has been great! My kids helped me again today by looking through their old costumes and stuffed animals and collected 21 loved items to donate. I think we can watch Toy Story 2 and maybe get rid of a little more before the end of the month.